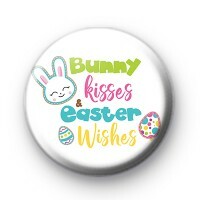 Super cute 1 inch Easter themed badge with the sweet slogan 'Bunny Kisses and Easter Wishes' written in a colourful font. With cute bunny and Easter egg illustrations. This is a great badge Easter to give out to your children or pupils at Easter. We have a huge range of Easter badges which are ideal for teachers to give out to students. Kids love them. All of our badges are handmade in our UK workshop.